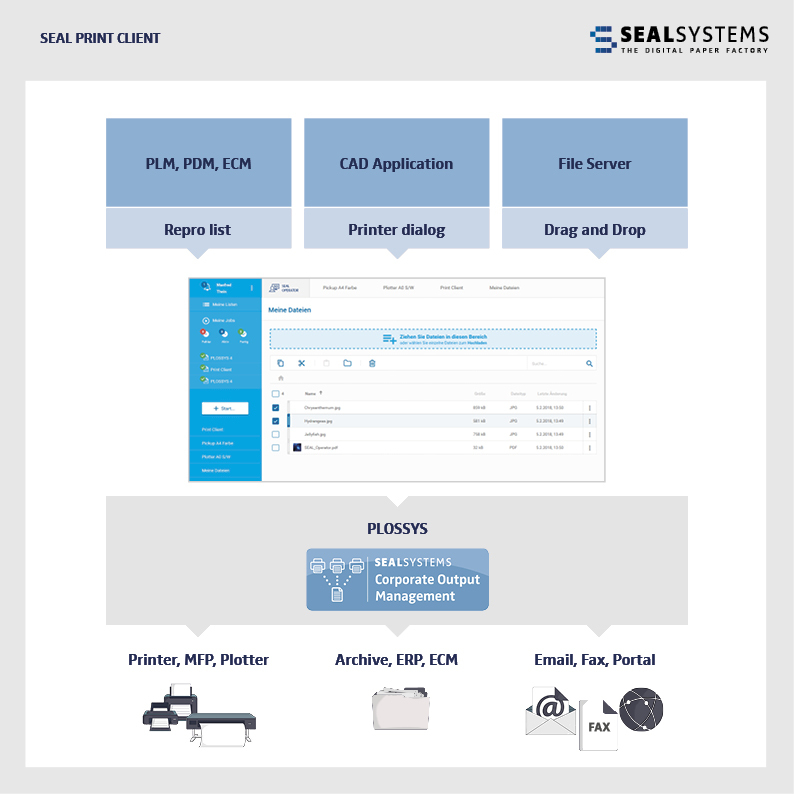 The SEAL Print Client is a web-based commissioning tool with which your users can send print jobs of all kinds to the output management system from the workstation or on the move. You can use documents from various storage locations (such as a desktop, file server, SAP repository) and systems (CAD, PLM, PDM, ECM) without having to roll out additional software. The output can be done in many directly printable graphic formats like PDF, TIFF or HPGL. With additional options, Office or drawing formats can also be converted on the fly for output and commissioned for printing. SEAL Print Client – What is that? 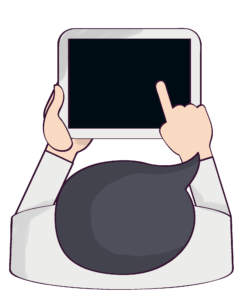 The SEAL Print Client offers the convenience of a desktop application – such as operation via drag & drop, clipboard or keyboard shortcuts – while being suitable for mobile use. It works on workstation devices as well as on smaller pad displays and can be easily operated by touch. A rollout is no longer necessary, a command in the browser is sufficient. With single-sign-on technology, the client integrates seamlessly into existing application landscapes. In addition, it offers the possibility to automate all functions of the interface via script. Our goal in the development of the client was to provide our customers with a tool that could be used on the one hand with the functions known from the previous PAD, P2P and NWC clients and at the same time with new trends such as electronic output and cloud printing. The SEAL Print Client offers both on a current technical basis. The application possibilities of our Print Client are manifold and are focused on your requirements. 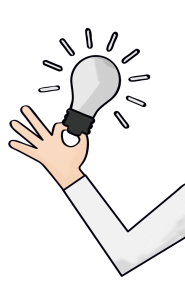 The print collection function allows departments in the CAD, PDM, PLM and ECM departments to manually record a wide variety of documents and combine them into a single phrase. E.g. a variety of CAD drawings can be collected and processed in one output process. An extension provides the function in the repro-center. Employees from a wide range of specialist departments can manually enter their tasks into the SEAL Output Client and delegate them to the repro-center. There, the print jobs are finally parameterized by experienced employees for large format output (plotter). Thus, a distinction can be made between the different processing steps (commissioning and finishing). With web-printing (on premise or through cloud printing), the Print Client offers your external visitors, employees, participants and students the opportunity to immediately create a print job without driver installation and send it to a specific printer or printer queue. This increases comfort and service without additional effort for your IT infrastructure. For web printing, use a web browser of your choice. This will generate and parameterize your print job. Your visitors can have access to a printer without having to install a driver (guest printing). Screenshot 1: Data range where documents can be uploaded and downloaded from the desktop. Screenshot 2: The actual print client with the settings of the printing parameters for the whole phrase. Screenshot 3: Settings for a single document in the phrase. Which documents and data can be processed? All neutral formats (PDF, TIFF, HPGL) and native formats (CAD formats, MS Office documents) can be collected and processed. If desired, an automatic conversion to a specific format can be carried out. Can additional information be provided or taken into account? Special information for a custom cover page, billing information cost center (KSt.) And status and metadata can be collected and processed by the SEAL Output Client. The SEAL Output Client is available for the PLOSSYS 4 and PLOSSYS 5 output management. The service is provided across systems on a web server. Which output channels and processing options are available? All output queues in our output management can be used. In addition to the printed output (MFP, plotter), the focus is also on electronic distribution. Processing as a set, with stamp/watermark, pool printer, with scaling and printer-specific finishing is possible. *no newsletter, no address sharing, contact only the the mentioned purpose.